Dr. Barr is a licensed Physical Therapist and owner of Barr & Associates Physical Therapy. 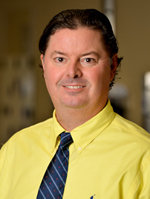 He earned his Master’s Degree in Physical Therapy in 1999 and later his Doctorate in Physical Therapy in 2005 both from the University of St. Augustine for Health Sciences. He has a Bachelor’s Degree in Exercise and Sport Science from the University of Florida, which he received in 1993. He specializes in the treatment of orthopaedics, osteoporosis, balance and gait disorders. He is Certified in Manual Therapy as well as Ergonomic Assessment.